Last week, I received a request on what one should do if such a scenario ever occurred. In the past, I posted articles on Abnormal Realm with suggested instructions to follow upon encountering certain cryptids. As I mentioned in them, such topics were in many discussion I had with my friend Pat years ago. I recall one summer where the possibility of brushing with Bigfoot came up while making plans for a camping trip. At the time, I was unaware the place we would be going to had several sightings of the creature back in the 1960s and 1970s. Upon Pat sharing this information with me, sparked the talk on actions to take if a confrontation happened. The discussed scenario is hypothetical, but anyone researching about the cryptid would discover every year there are hundreds of sightings across North America along with several rare incidents where humans were within arms reach of Sasquatch. On the fluke of such an incident, Pat and I examined on the possible outcomes. One circumstance we recognized was the chance of running into an aggressive Bigfoot which I will save for a future article. The situation we focused on was unexpectedly crossing paths with the creature. In past research Pat and I had conducted, we believe Sasquatch is a highly intelligence and intentionally avoids contact with humans. This means the creature steers clear of anything involving with people and tries to keep a healthy distance away from those it detects with heighten senses. There were several cases we read where people described Bigfoot expressing a confused or shocked look when directly meeting up with humans. Possible anyone coming face to face with Sasquatch could had caught the cryptid off guard as it didn’t expect to meet any humans. On the question on what to do when confronting Bigfoot, just know the creature is not hunting or stalking you, more likely the event occurred by chance which you maybe able to walk away from by following these suggestion. Now, I may mention this again in future articles as remaining calm and maintaining focus needs to be empathized. The human brain will go into a melt down when facing anything that should not exist such as an encounter with Bigfoot. The situation can quickly become dangerous if you enter a state of fear or panic. You must be alert and aware of the surroundings before reacting. Just keep this in mind, if the Sasquatch is not hostile there be an opportunity to get away from it. In the near future, I will follow-up this post with an article on what to do when facing an aggressive Bigfoot. As long as the cryptid is not baring its teeth, screaming, shouting, howling, stomping its feet, waving its arms, beating the ground, breaking trees and branches, or throwing rocks ,then the creature does not perceive you as a threat and you have a chance. 1.) As mention in past articles, you must asset the situation. Ask yourself is the creature real? You could have walked on a movies set or be the victim of a prank. Hoaxes have happened in the past before where people encountered someone dressed in a gorilla suit. There are ways to determine if the Bigfoot you are confronting is real or fake. Is there a vile smell in the air? In some cases, people describe a putrid odour to follow Sasquatch. 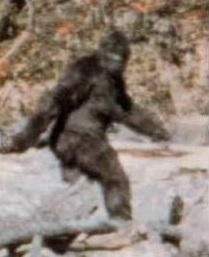 Is there any features you can see in determining the cryptid’s gender? Most hoaxes do not bother to make their costume anatomically correct. Did you mistaken the creature for another animal such as a bear on its hind legs? 2.) Now, if convinced the Sasquatch is real here is some more information to keep in mind. You can not out run, out swim, out climb or fight off a Bigfoot. According to some cryptozoologist, Bigfoot is a territorial creature which sees you as the intruder. Your means of escape is not to provoke the cryptid and start acting submissively by lowering your head while avoiding eye contact. Remain motionless, try not to make any noises or facial expressions and wait till either the creature withdraws or an opportunity opens up for you to leave. At this point, your aim is to see Bigfoot’s reactions without agitating it. 3.) Allow a few seconds to pass and see if Bigfoot withdraws first. If it does, wait till the creature is out of sight and slowly retreat from the area. Any screams, snapping of branches or any other noise you hear quicken your pace in exiting the scene. 4.) If Sasquatch does not withdraw, this behaviour is its way of asserting dominance and indicating for you to leave. Still have your head lowered, slowly withdraw away from Bigfoot without showing it your back. Once you at of the creature’s view, make your way out of the area as quickly as possible. 5.) If Bigfoot starts approaching but shows no hostility as you withdraw, pull out coins, shiny objects, anything with bright colours or even food and drop it in front of you as you walk away. Hopefully this will distract the cryptid giving you time to gain some distance. 6.) If the creature is upon you without showing no signs of aggressive, you need to stop moving and crouch down to the ground. You have to endure of few moments of being examined by the creature. Here take no action, maybe even attempt to play dead as in some reported cases, eventually Sasquatch gets bored and walks away. Once out of sight, quickly leave the area. 7) Just to note. If you hear Bigfoot talking such as it saying “Hi” or something else in English, do not respond back or attempt to engage in any conversion. This may provoke the creature or encourage it to stay around longer which you do not want to happen A few cryptozoologist, theorized Bigfoot speaking is nothing more than the creature mimicking humans. 8.) Now, after such an experience the choice will be upon you whether or not to share it with others. Hope this article maybe of some use to anyone finding themselves in hypothetical scenario where they encounter a non-existing creature which sightings of it continues to this day. Excellent advice, especially #5 which is very smart. It’s also worth remembering that the Bigfoot you are looking at is probably not alone, especially if it is a juvenile or a child. Good point John. Last thing you do not want coming at you is an anger mother Bigfoot. I found number five interesting too. Even in folklore, creatures are often distracted by bright shiny objects. #1 is also valid and something I probably wouldn’t have thought of initially. I’ve been in the woods where I had that strange sense of being watched, but in my case it was a visit to a haunted battlefield. Either way–creepy when the woods go silent and still. I know of someone who was on the receiving end of a Bigfoot prank and almost shot the guy in the suit. Whew! It’s good he realized in time!